Bring an Element of Magic to Your Sealed Pavers. We’re a Top Rated Local® Polishing Company. 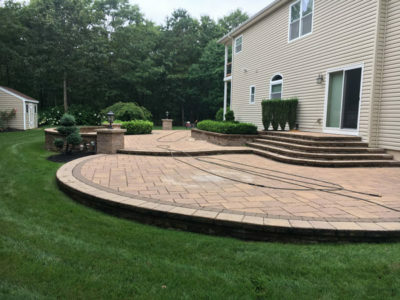 Sealed paving services offered by Premier Polishing in Holbrook not only make your stamped concrete or other surface beautiful, but they will also protect it from the elements, making it durable for years to come. Enjoy your outdoor spaces with sealed pavers. Contact us today! You just had your concrete patio stamped a beautiful red color to match the exterior of your home. As you sit outside on a cool summer night, clouds roll in. You wonder how the rain will affect your new stamped concrete patio. Is there something you can do to protect it from the elements? Premier Polishing Corp in Holbrook, NY, specializes in sealing stamped concrete and also sealing pavers. Contact us today to get your free estimate! WHY SEAL STAMPED CONCRETE AND PAVERS? Stamped concrete is concrete that is patterned, textured, and/or embossed to resemble brick, slate, flagstone, stone, tile, and wood amongst others styles and patterns. Pavers is another word for paving stones, or the thin, flat stones normally used as stepping stones to get to your stamped concrete patio or driveway. You’ll normally see stamped concrete outdoors on patios, sidewalks, driveways, and pool decks. Stamped concrete is popular because it can be stamped to resemble other, more expensive building materials, making it more cost effective and appealing to many. Protection. Sealing stamped concrete and pavers can be compared to waxing your car, wearing sunscreen or using stainguard when you wash your clothes. A sealer will prevent fading caused by UV rays and protect it from stains and harmful chemicals. 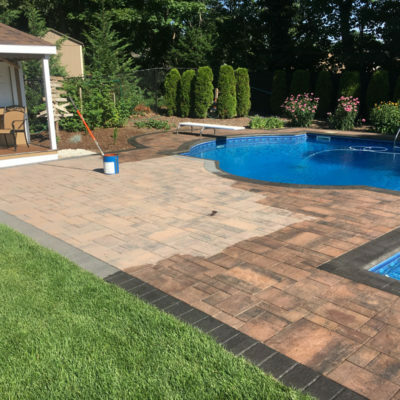 Stamped concrete and pavers can become stained from many elements in our environment, including chlorine, salt, other chemicals, leaves, dirt, fertilizer, pet waste, and more. Sealants form a barrier on your stamped concrete, preventing these elements from penetrating to the concrete below. Appearance. 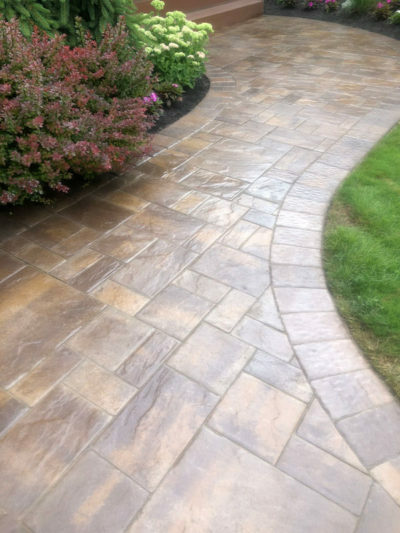 A sealer will improve the appearance of stamped concrete and pavers and will keep your stamped concrete and pavers looking great for many years. Furthermore, a stamped concrete sealer can rejuvenate an old, existing stamped surface. Stamped concrete and pavers that have been sealed have a rich color and, depending on the sealant, a glossy sheen. Sealers for stamped concrete and pavers come in many different gloss levels, including no-gloss to high-gloss and everywhere in-between. If you opt for a tinted sealer, the stamped concrete or pavers’ color can be additionally enhanced. Prevent efflorescence, which is a white, powdery residue that can build-up on the surface on concrete. If you have an outdoor pool, you may want to consider slip resistant sealers if your concrete or pavers are not textured. Prevent freeze damage. Here in New York, the winters can be quite cold, with many days with varying temperatures. Sealed stamped concrete and pavers will reduce the chance of freeze thaw damage, which can be cracked or surface flaking of the concrete. This happens when water seeps into the concrete surface and then expands as the temperatures drop and ultimately freeze. A sealer keeps the water, and the water beads on the surface of the sealant. If you notice that water is not beading, this is a sign your sealant needs replaced. HOW OFTEN DO YOU NEED TO RESEAL STAMPED CONCRETE AND PAVERS? The answer depends on how frequently you use the area that is sealed. High traffic areas will likely need to be resealed on a more frequent basis than a lighter used area. Typically, you can expect to reseal every two to three years to keep your concrete and pavers looking their best. Without sealant, the beautiful color of your much-loved concrete can start to fade. If you are concerned about the sun in particular, there are UV protectant sealers that will virtually eliminate any fading due to the constant exposure to sunlight. WHICH SEALANT IS RIGHT FOR MY STAMPED CONCRETE AND PAVERS? Most installers of stamped concrete and pavers recommend using a penetrating or film-forming sealer outdoors and selecting a more natural, matte finish. Being outside, it’s important to remember that sealers used on exterior stamped concrete or pavers need to be able to allow both air and moisture to pass through. WHAT IS CURING AND WHY DOES THAT MATTER FOR SEALING STAMPED CONCRETE AND PAVERS? Curing refers to the process of allowing concrete to do what concrete was designed to do: hold up for centuries. Concrete made up of water, sand, and cement needs time to settle. This is why when the temperatures drop, so do construction and road projects. The warmer the weather the better since it’s the water and the hydration rate that makes concrete strong. Concrete should not be poured in temperatures below 50 degrees in order for it to do its job. When concrete is outside, wind and humidity play a factor as well. Concrete takes about a month to cure, or for the water in concrete to react properly with the other materials. If your stamped concrete or pavers are new, you need to wait at least seven to fourteen days before applying a sealant, but Premier Polishing Corp recommends waiting the full month to ensure the best job possible. Premier Polishing Corp in Holbrook takes pride in offering the best sealant job for your stamped concrete and pavers. Our staff is trained on an on-going basis to ensure we all work as a team to deliver the best service to our customers. We will power wash your concrete before we start to ensure all dirt, minerals, and chemicals are removed before sealing your stamped concrete and pavers. Sealing stamped concrete and pavers is the best thing you can do extend the life of your concrete over time, prevent cracks from moisture and the eliminate the buildup of mildew, and keep your stamped concrete and pavers looking their best. Premier Polishing goes above and beyond to make sure you’re satisfied, and we’ll make it right if you’re not. Exceptional service is our motto and as the Top Rated Local® polishing company, we’re here for all of your stamped concrete and polished concrete needs. Call us today to get your free estimate!